this time last year i was turning thirty. well, this time and in a month or so. and last year for my thirtieth, i "treated myself" to the one thing i had really wanted for as long as i could remember, but could never find the balls to buy for myself; my first tattoo. i stayed local and went to a friend of a friend for something "small" and pretty, and most definitely me - a pink rose. traditional, yes; "just like everyone else", maybe; just what i wanted, absolutely. for the girl who always wears pink on wednesdays, who has never met a flower she didn't like, and who's claimed this country as her own, an "english rose" was the perfect thing for my first piece. or, as my mum currently wishes was the case, my ~only piece. i loved that tattoo with all my heart - it was perfect in every way, even though it was technically flawed. some of the lines were rough, the shading didn't heal as bright as i'd liked, and sadly, what i thought was just bruising turned out to be blow-out (where the needle has gone too deep and the ink settles lower in the skin that it should, leaving a blue, bruise-like blur), leaving the whole thing a lot more faded and murky than i would have liked. i still loved it, but the permanent reminder that it wasn't quite "right" started to make me really self conscious of it. and not in the way that people tell you you'll feel when you start to "regret the decision", because i didn't, not at all. it just happens (of course it would happen to me, though). despite the fact the whole ordeal wasn't very pleasant, i wasn't put off, at all, if anything it made me want more, more. i'd started to follow a bunch of artists on instagram, and really pay attention to those with really quirky and girly styles. jody dawber was one of those artists. she was based up north at the time, but as luck would have it, an announcement on her bio said she'd be moving to essex in 2015. in the back of my head it was decided, i'd be getting my next tattoo done by jody, whether she liked it or not. then life happened and yeah, it's now 2015. about three months ago, as i was scrolling through my ig feed i noted a "bookings" post from her, for canada. canada, north america. reading through the message, she announced she'd be off travelling around america at the end of august, and she was looking to book work where she was going. i panicked. i panicked a lot, and emailed her straight away and booked an appointment without even an idea of what i wanted. i booked an appointment. because panicked. an appointment i had to change with only a few days notice because of stupidity, but an appointment that i finally fulfilled last friday. i'd been back-and-forthing with the shop manager danni for weeks, throwing ideas at her. 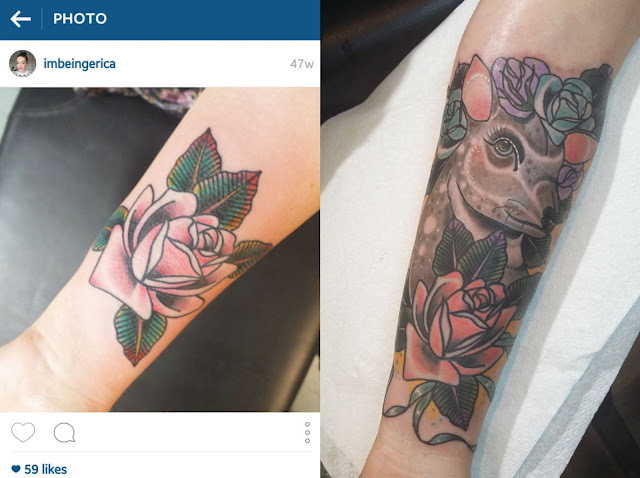 i knew i wanted jody to hide the blow-out by adding her style to the existing rose, and i wanted a deer. well, to be honest, i wanted a "stag in drag" complete with pink lippy and false eyelashes, and danni bloody loved the idea. other than giving her that brief, i had absolutely no contact with jody until the moment i walked into jayne doe in hornchurch for my appointment. jody showed me the stencil of my stag in drag, and we assessed him for size in the space i had left on my forearm; with a quick consultation and comparison, we decided he wasn't going to fit. antlers, man, they're a ballache; they would have crept up my bicep and distorted the whole piece, and so we decided a fawn/doe would fit the area better, and so it was. jody added the floral crown to his (still a boy, i've decided) head, and i insisted on eye lashes still. 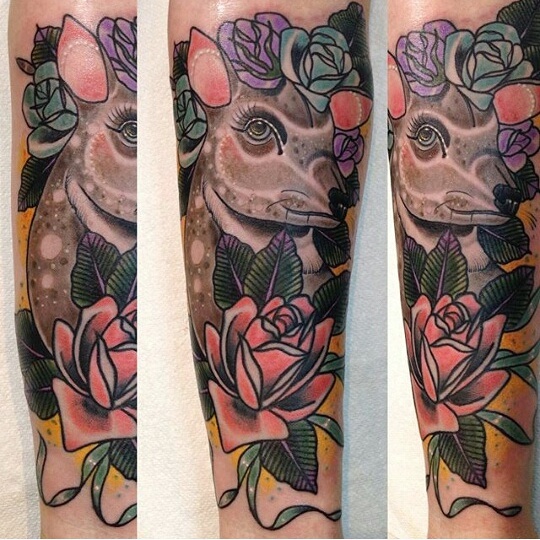 i wasn't expecting her to, but jody reworked the entire original rose to make it brighter and fit better with the deer, and added embelishments like the blue ribbon and the yellow fading and polka dots on the outside to cover as much of the blow-out as possible. she really did an amazing job. we had a serious love/hate relationship for the whole time i was with her, because my sweet lord, that hurt a lot more than i remember it hurting. going over the original rose was probably the most excruciating pain i've felt in a long time, and i've just had a broken finger. remember? it was not nice, but i would still 100% recommend to everyone. so, lady doe nut (his stage name) is now healing well, and i am too impatient to see how he heals. he's so sweet and adorable - he has freckles, man! i feel like the photos don't do him justice, and he's already changed colour so many times since friday, so, i guess time will tell. if nothing else, i'm just pleased i finally got to meet jody, and get some of her original artwork on me. and that she covered up my blow-out and made me love my arm again. even though it currently feels like it's on fire.